Each day, school bus drivers and aides are the first contact thousands of young people have outside of their families. Much like their teacher counterparts, school transporters get to know the students who ride their bus, and they can be among the first to witness a change in a child’s behavior. Mary Drew displays an OK2SAY placard during the session. Because of their important connections with students and their well-being, local transportation supervisors recently learned about another tool to help the students in their care. At an area-wide transportation supervisors’ meeting on Oct. 5, 2018, 19 local transporters from 11 Char-Em ISD school districts heard details about the “OK2SAY” program, a Michigan call center for confidential reporting of concerns regarding the safety of students, staff and schools. Presenting about the “OK2SAY” program was Mary Drew, Consumer Programs Administrator assigned to the Michigan Office of Attorney General. The meeting was held at the Boyne City Education Center. 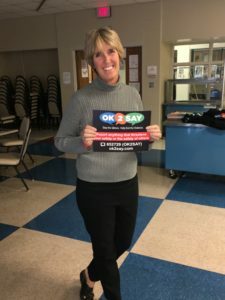 “Mary has an infectious passion for the subject matter, having been directly involved in processing thousands of success stories through the OK2SAY program. 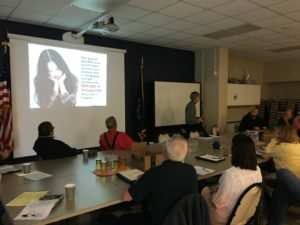 She held the group in rapt attention for the entire presentation,” said Phil Haldaman, Transportation Supervisor for Charlevoix-Emmet Intermediate School District. OK2SAY allows students, staff, parents and others to confidentially report tips of potential harm or criminal activities directed at school students, school employees, and schools. It uses a comprehensive communication system to facilitate tip-sharing among students, parents, school personnel, community mental health service programs, the Michigan Department of Health and Human Services, and law enforcement officials about harmful behaviors that threaten to disrupt the learning environment. Drew told the group that since OK2SAY’s inception in 2014, it has helped to save more than 16,000 people – mostly at-risk students – throughout Michigan, ranging from suicide prevention to help with depression and drug abuse, to family issues beyond their control. Many have been urgent calls for help. Since Feb. 14, 2018, the Call Center has received 289 tips of imminent attacks against Michigan schools that were interrupted because peers of the perpetrators took the time to call or text the OK2SAY hotline with vital information. “These student leaders potentially save many lives and inadvertently became silent heroes,” Haldaman said. As key personnel in the lives of children, the transportation leaders heard about how they can teach their teams to recognize at-risk behaviors and concerns, and how OK2SAY can be a resource to provide prompt assistance. They were provided with placards and materials to post on their buses as well. “Our time with Mary only reinforced how we can help mentor and encourage that kind of behavior in the student populations we serve,” Haldaman added. The transportation supervisors learn about the OK2SAY program. Drew also told the group that OK2SAY’s administrators have an extensive network of law enforcement connections nationwide to aide in the sharing of key intelligence on criminal activity, some of which crosses state lines. They have a professional networking alliance with Interpol, as some tips that have come in involve students with international connections who need immediate help, Haldaman noted. OK2SAY is the student safety program which allows students to confidentially report tips on potential harm or criminal activities directed at school students, school employees, and schools. It uses a comprehensive communication system to facilitate tip-sharing among students, parents, school personnel, community mental health service programs, the Michigan Department of Health and Human Services, and law enforcement officials about harmful behaviors that threaten to disrupt the learning environment. Anyone can report tips on criminal activities or potential harm directed at students, school employees, or schools. 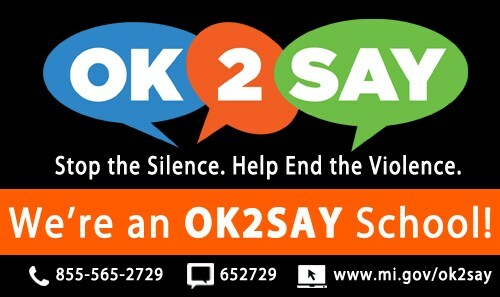 OK2SAY is available state-wide for public and private schools in Michigan; anybody can submit a tip. Specially trained technicians receive the tips and filter the information to the appropriate agency to provide a timely and effective response. Oct. 22-26 is National School Bus Safety Week, sponsored by the National Association for Pupil Transportation, the National School Transportation Association, and the National Association of State Directors of Pupil Transportation Services.